Frank Corrado is finally almost free. 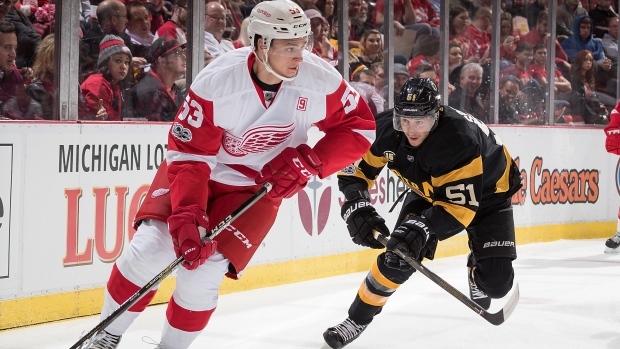 Weeks after the defenceman went public with his frustration over a lack of playing time, the Toronto Maple Leafs placed the 23-year-old on waivers and claimed another right-handed defender, 25-year-old Alexei Marchenko, from the Detroit Red Wings. Corrado had been a healthy scratch for 35 of the team's first 42 games this season. He has appeared in just two NHL games, registering no points in those contests, but tallied three assists during a seven-game American Hockey League conditining stint in early January. Corrado signed a one-year, $600,000 contract with the Maple Leafs as a restricted free agent over the summer. Toronto claimed him off waivers from the Vancouver Canucks before the start of last season, but benched him for the first ten weeks before he made his debut on Dec. 15, 2015. Toronto had encouraged Corrado to improve his strength and conditioning in order to be better prepared for the rigours of the NHL. After Dion Phaneuf was traded last February, Corrado was in the lineup more frequently until the end of the campaign, posting one goal and five assists in 39 games overall. Responding in December to Corrado's assertion that Toronto's head coach Mike Babcock "doesn't like" him, Babcock said he was "disappointed" by how Corrado was viewing the situation. "If you feel that me liking you has anything to do with whether you play or don’t play, you’re missing the bill big-time," he told reporters. "I love the guys and I’m hoping for all of them, that they do well." When an injury to Morgan Rielly slotted Corrado into the lineup on Jan. 19, he struggled at times and said after he felt his performance was "inconsistent." When asked to assess Corrado afterwards, Babcock declined to comment, saying he'd have to watch the tape back first. That will likely be his swan song with the Maple Leafs, who moved Corrado to waivers to make way for Marchenko. Drafted 205th overall by Detroit in 2011 (while under Babcock's rule behind the bench), Marchenko inked a two-year, $2.9 million extension with the Red Wings over the summer. He's played in 30 games this season, with just six assists. Babcock has always been very complimentary of Marchenko, telling the Detroit Free Press in February 2015, "I hope that's our trade" in response to whether the team was looking to trade for another defenceman (Marchenko was in the AHL at the time). "I like him," Babcock told the Free Press in 2015. "He's never in the scoring chances against. I actually like him better after the game, when I watch the tape, than I like him during the game. He's got to get quicker, but he's really smart." At 6-foot-3, Marchenko has good size and is a steady defender who doesn't make many high-risk plays and moves the puck well. It's a low-risk move for Toronto to bring him in, especially with his connection to Babcock. His injury history is of some concern - he's missed significant time with a lower-leg injury and an ankle injury since 2014-15.